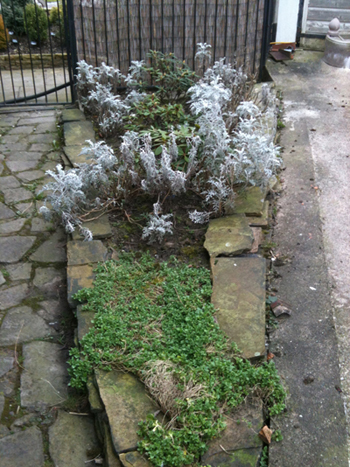 It's a bit of a cheek to call it the side garden as it's really just a sort of triangular bed at the side of the house! 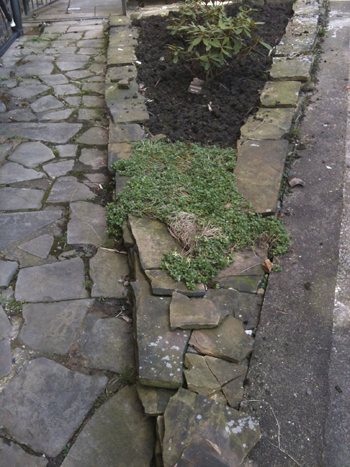 We did attempt to do something a few years ago but didn't keep on top of it. 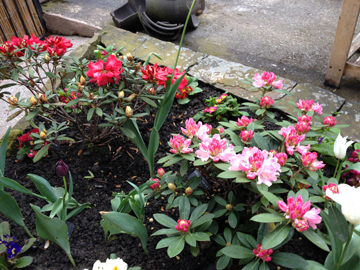 At the moment(March 2012) it consists of three dwarf Rhododendron ('Queen Alice', 'Dreamland' and 'Red Peste'), surrounded by Senecio cineraria 'Silver Dust' and some Aubretia at the front. 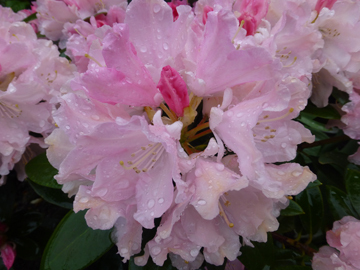 The photos below (taken early March 2012) show how the 'Silver Dust' has nearly taken over the Rhododendrons! 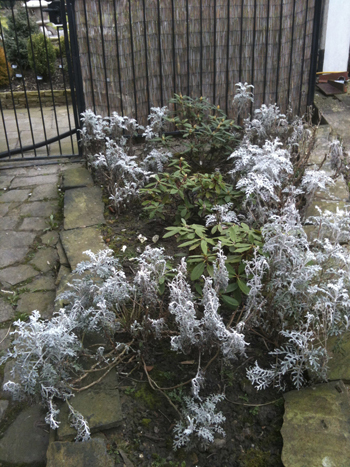 We will shortly be removing the 'Silver Dust' as we have clearly let it go wild - to say the least. 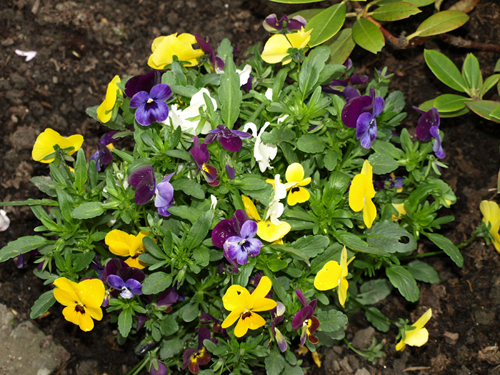 It will be replaced with a selection of Violas and Primula which we have already purchased. 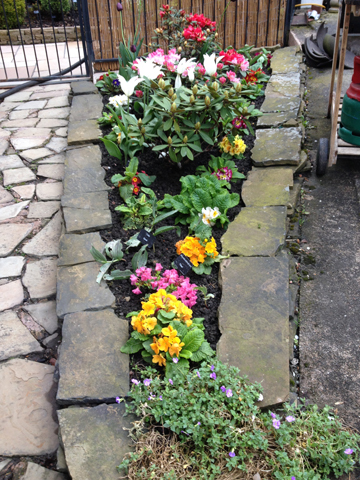 12th March, 2013: As mentioned above, we decided to pull out the 'Silver mist' which had got out of control and to give the bed a quick turning over. 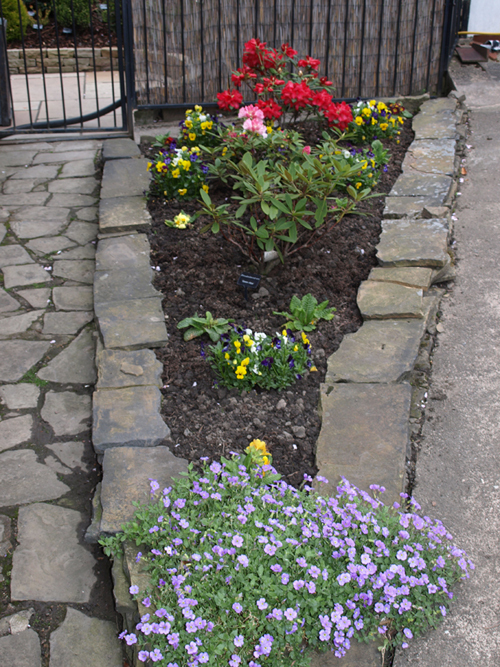 A mixture of Violas and Primulas were planted in order to give the bed some colour whilst waiting for the Rhododendrons to open. 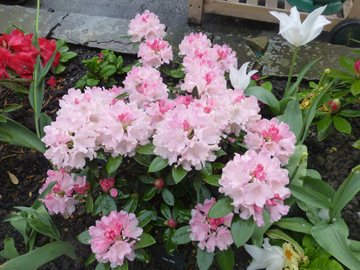 The photos above and right were taken on 17th April, 2013. 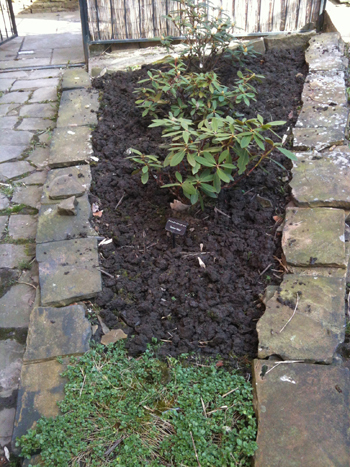 Having seen Slack Top Nurseries at the Harrogate Spring Flower Show (April 2013) we decided to pay them a visit. 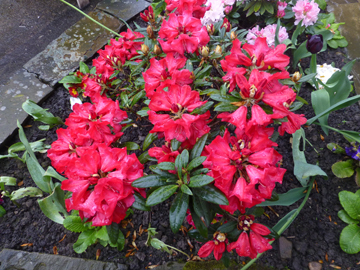 Although they specialise in Alpines they also do a few other plants. 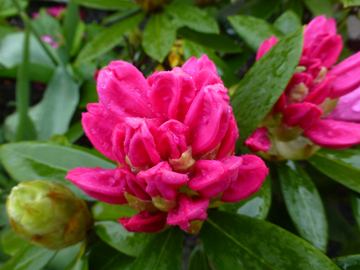 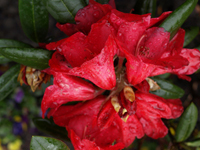 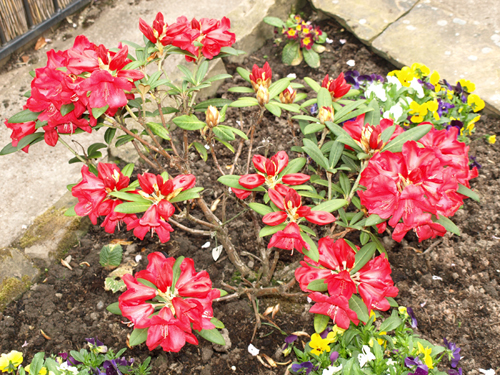 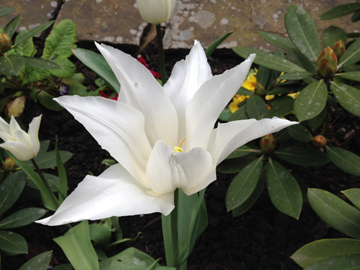 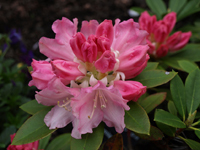 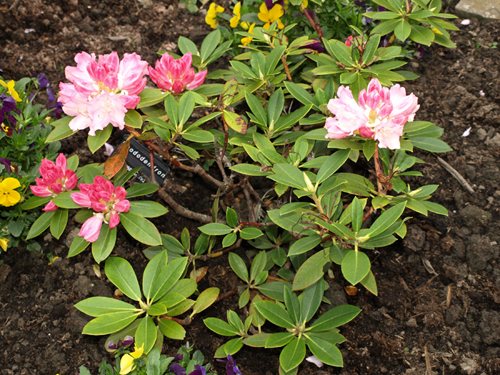 We spotted a lovely miniature Rhododendron 'Oban' and duly purchased it for our 'Rhododendron triangle!'. 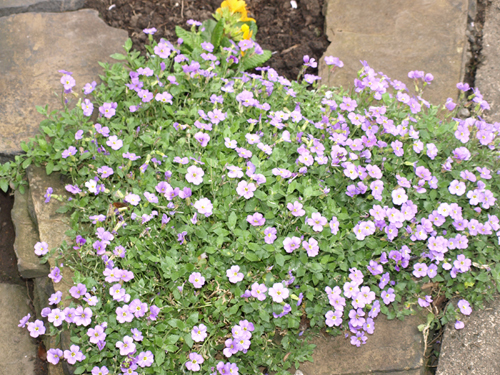 It was coming to the end of its flowers when we purchased it so will have to wait until next year to see if settles in and flowers. 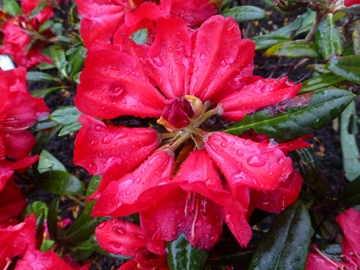 The photo here was taken on 4th April, 2014. 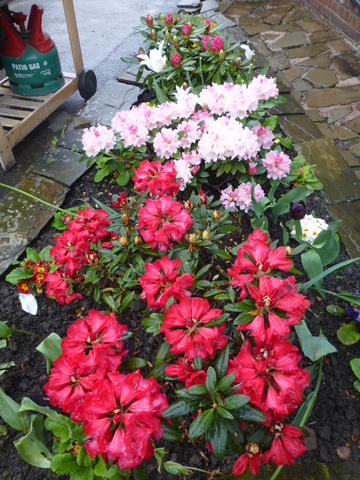 We decided to opt for a lot more colour around the Rhododendrons this year whilst waiting for them to open. 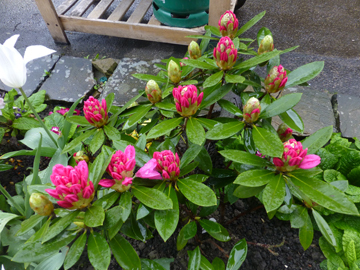 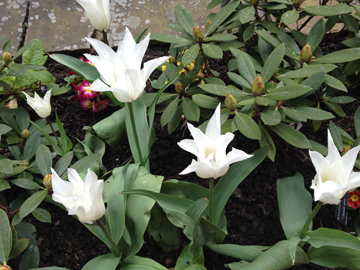 Of the three bushes 'Queen Alice' didn't flower at all last year but in March this year buds have appeared so we are hopeful that they will open. 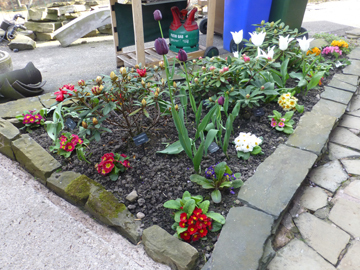 I planted primroses all round the edge of the border, with the addition of tulips in some of the gaps in the centre.